Trapped Neutrophil syndrome is an inherited disease affecting Border Collies. This disease affects the immune system and its ability to fight infection. Affected dogs most commonly present between the ages of 6-12 weeks with signs of immune dysfunction. Symptoms of the disease are dependent on the specific infection that the dog is fighting and may include failure to thrive, poor growth, weight loss, lethargy, diarrhea and vomiting. Affected dogs may also present with active respiratory, skin, eye or ear infections. Affected puppies are often smaller than normal littermates and can have a narrow, elongated, ferret-like head. Occasionally affected dogs can be mildly affected and not show signs of disease until 1 to 2 years of age, but typically affected dogs die from an infection by four months of age. Genetic testing of the VPS13B gene will reliably determine whether a dog is a genetic Carrier of trapped Neutrophil syndrome. 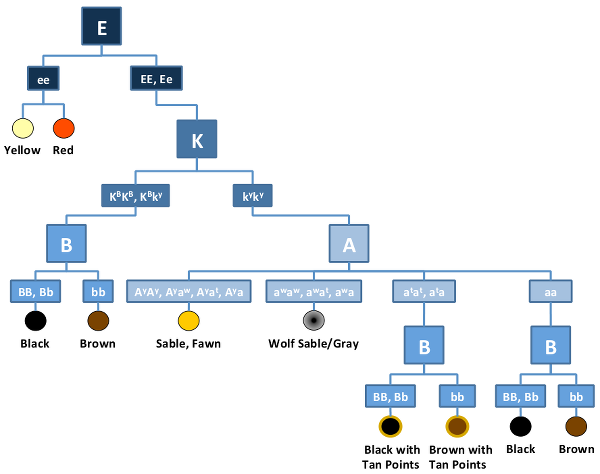 Trapped neutrophil syndrome is inherited in an Autosomal Recessive manner in dogs meaning that they must receive two copies of the mutated gene (one from each parent) to develop the disease. In general, carrier dogs do not have features of the disease but when bred with another carrier of the same Mutation, there is a risk of having affected pups. Each pup that is born to this pairing has a 25% chance of inheriting the disease and a 50% chance of inheriting one copy and being a carrier of the VPS13B gene mutation. Reliable genetic testing is important for determining breeding practices. In order to eliminate this mutation from breeding lines and to avoid the potential of producing affected pups, breeding of known carriers to each other is not recommended. Dogs that are not carriers of the mutation have no increased risk of having affected pups.